We’ve all been there. Our car or truck or motorcycle has gotten a flat tire. The usual culprit is the unassuming nail. Normally, nails are our friends. They hold together our essentials in life: house, wardrobes, dog houses, your child’s swing set, and our favorite paintings on the wall. But, in this case, the nail is not our friend. In fact, the lowly nail is now our worst enemy and once he’s out of our tire, nothing is off limits! With towing services in Northern Colorado and Wyoming, Lee’s Towing understands the frustrations of getting a flat tire. We’ve put together this quick guide to help you change your flat tire and be back on your way in no time. If you are driving when you get a flat tire, safely pull over to the side of the road and turn on your emergency blinking lights. This alerts other drivers from a distance, so they have time to leave a wide berth for you. This is especially important at night when visibility is limited. Loosen your lug nuts, and raise your car up with your car jack. Your owner’s manual can assist you with where to safely place your car jack since it’s different for every vehicle. You will use a counter-clockwise motion to loosen the bolts, and you’ll need to remove the hub cap if your vehicle has one before this step. Jack your vehicle up with about six inches of ground clearance, giving you plenty of room to maneuver the tires into place. Pull the flat tire straight towards you, leaving the lug nuts in a place so you don’t lose them. Replace the flat tire with the spare tire in the same manner. Replace your lug nuts on the tire but only loosely. Tightening the lug nuts all the way will result in the tire spinning. Lower your car back to the ground and remove the jack. Tighten your lug nuts slowly and only a little bit. Then go to the lug nut directly across from it and tighten it. Repeat until all lug nuts are tight. Store your tools away and you’re good to go! Pull as far off the shoulder of the road as possible. Leave your hazard lights on throughout the entire tire changing process until you are safely back on the road. Put the car in park before changing the tire. Also, it’s a good idea to place a nearby rock or piece of wood in front of and behind the opposite tire you are changing. This will prevent the car from rolling. Remember you are driving on a spare tire, which is usually smaller than your other tires. Spare tires are not designed to go long distances and at great speeds. They are tires designed to be used in emergencies to allow you to get to an auto repair shop or tire shop in order to purchase a new tire. Keep your flat tire. Often, your flat tire can be salvaged with a patch at the tire shop, saving you hundreds of dollars on a new tire. Be sure to ask your auto dealership. It’s very important to only loosen your lug nuts before you put on your spare. The last thing you want is to have to jack your car up even more because the spare tire was completely removed, leaving the rim touching the ground. These 5 Steps to Changing a Flat Tire assumes you have the tools to change a flat tire: a car jack, lug wrench, and a spare tire. If you don’t have these tools for tire changes, find the tire is hopelessly stuck, or you’re in your best dress or suit and simply don’t want to mess with it, call Lee’s Towing in Northern Colorado and Wyoming. 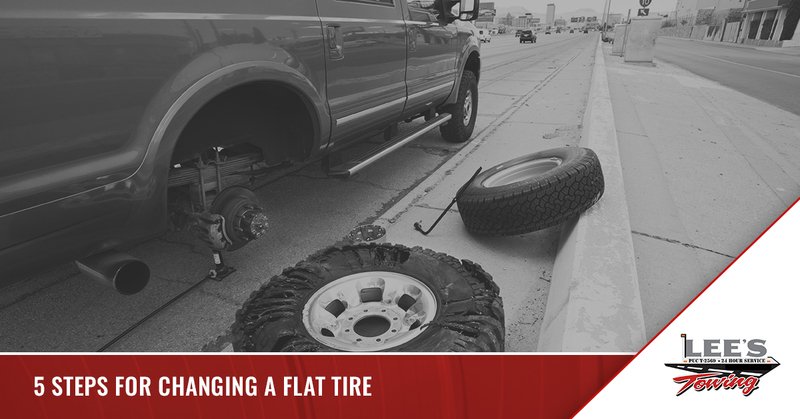 We’ll come out to your location and change your flat tire for you. Our mission is to have you on your way as soon as possible. Lee’s Towing doesn’t want a flat tire to ruin your day any more than it already has. Call us for all of your roadside assistance needs, including tire changes, towing services, lockouts, or offroad recoveries. Lee’s Towing puts you first. Contact us today!